In today's Hit and Run, Jay Jaffe looks at the end of the Pirates' long shutout streak, Todd Frazier's power surge, and a great day for some of MLB's top rookies. The Pirates finally gave up a run on Wednesday—two of them, in fact—to end a 35-inning scoreless streak dating back to the eighth inning of Saturday’s 4–3 win over the Phillies. Even so, Pittsburgh's 3–2 victory over the White Sox in Chicago was the team's seventh straight, matching a season high; the first such streak began what's now a 20–5 run. The Pirates have notched five shutouts in their last seven games, yielding just five runs over that span. This latest stretch began on June 10 against the Brewers, when Charlie Morton threw 7 1/3 innings of three-hit shutout ball, with Tony Watson and Mark Melancon finishing the job. After a day off, Pittsburgh faced the Phillies, against whom Jeff Locke and six relievers combined for a 13-inning shutout and a 1–0 win. After the win on Saturday, the Pirates decided they liked extra-inning scoreless duels so much that they'd try another one on Sunday, this time with A.J. Burnett going nine and allowing just five hits, with two relievers finishing what became a 1–0 victory in 11 frames. On Monday, they trounced the White Sox, 11–0, with Francisco Liriano providing eight innings of two-hit, 12-strikeout work, and on Tuesday it was Morton once more going seven scoreless, again followed by Watson and Melancon in a 3–0 shutout of Chicago. On Wednesday, after the Pirates scored three runs in the top of the first inning, Locke held the White Sox scoreless for the first five innings before yielding two runs in the sixth via an Adam Eaton walk, a Melky Cabrera double and an Avisail Garcia single. The 35-inning scoreless streak was the longest in the majors this season, besting a 34-inning one from May 17–22 by the Giants. Via MLB.com, it was also the fourth-longest shutout streak in franchise history: Pittsburgh went 51 innings without allowing a run in 1903 (the longest such streak in major league history), 45 innings in '31, and 36 innings in '72. Meanwhile, catcher Francisco Cervelli was behind the plate for 56 consecutive scoreless innings, tying the 1903 team's regular backstop, Ed Phelps, for the longest such stretch in team history. With the streak, the Pirates are now 38–27, with the second-best record in both the league and the NL Central; they're still five games behind the Cardinals. They've allowed just 2.48 runs per game over their 20–5 run, and their 3.18 runs allowed per game is second only to St. Louis' 2.86 among teams in either league. The rotation's 2.83 ERA and 3.08 FIP are both major league bests, as is their rate of 0.6 homers per nine. Individually, four of the unit's starting five have been stellar. Despite allowing two runs (one earned) in his last start, Gerrit Cole leads the NL in ERA (1.71) and ERA+ (218) and ranks second in FIP (2.37) and quality start rate (85%) as well as sixth in both strikeout rate (10.0 per nine) and WAR (2.4); he still hasn't allowed more than three runs in any start. Burnett is second in ERA (1.89), third in ERA+ (198), fifth in both FIP (2.74) and WAR (2.7), and tied for sixth in quality start rate (77%). Liriano, the beneficiary of a .237 batting average on balls in play, is first in fewest hits per nine (5.7), third in strikeout rate (10.8/9) and sixth in FIP (2.96, a good match for his 2.94 ERA); he's allowed just five runs in 35 innings over his last five starts, striking out 47. Morton, who wasn't activated until May 25 after undergoing offseason surgery to repair the torn labrum in his right hip, has pitched to a 1.62 ERA through 33 1/3 innings thus far, with a 67% ground-ball rate covering for his meager 4.1 strikeouts per nine. At 30–35, the Reds aren't going anywhere, but their season would be even more of a lost cause without Todd Frazier. Frazier hit two home runs against the Tigers for the second night in a row on Wednesday, including a walk-off grand slam in the 13th inning that sent Cincinnati to an 8–4 win over Detroit. After victimizing rookie Kyle Ryan—making just his third major league start—twice on Tuesday, Frazier lit up the A-list on Wednesday, taking David Price deep in the fourth inning and then Joakim Soria in the 13th, ending the game at just four minutes shy of the five-hour mark. The walk-off grand slam was the majors' second this year, after the Padres' Derek Norris did it against the Pirates on May 29. The Bucs were also at the wrong end of the most recent Cincinnati walk-off slam, that by Ramon Santiago last Sept. 27. 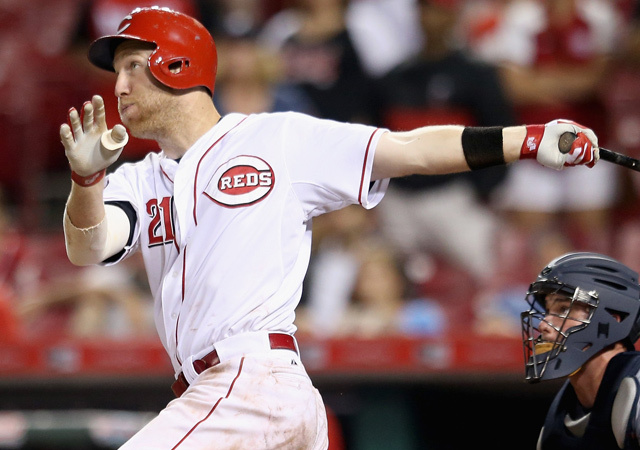 Perhaps more impressively, Frazier became the first Red to hit multiple homers in back-to-back games since Barry Larkin on June 27–28, 1991. Lee May is the only Red to go three straight games with multiple homers, from May 24 to 28, 1969; he also had a two-game streak in a July 15 doubleheader that season. Among the five other Reds to complete the feat are Hall of Famers Joe Morgan ('76) and Frank Robinson (twice, in '62 and '63). Frazier's binge now includes six homers in his last nine games, giving him 22 for the season; he's tied with Bryce Harper for second in the league and is seven shy of his career high, set last season. He's hitting .294/.361/.639 with a league-high 161 total bases; his slugging percentage and 3.7 WAR both rank third, while his 170 OPS+ is fourth. The 29-year-old slugger and New Jersey native has recently been connected to the Mets in trade rumors, but don't hold your breath. He doesn't exactly fit into the lineup if David Wright is able to return from his spinal stenosis around the All-Star break as hoped. And while Frazier has some experience (13 games) in leftfield, the tight-fisted Mets have big-dollar commitments to corner outfielders Michael Cuddyer (more than $17 million through next year) and Curtis Granderson (more than $40 million through 2017), and they’re not going to sit first baseman Lucas Duda, whose 140 OPS+ leads the team. What's more, even as they contemplate a sell-off, the Reds have relatively little incentive to deal one of their more affordable players, as Frazier is in the first year of a two-year, $12 million deal and will still have one more year of club control after that. Francisco Lindor's agony-prolonging–ninth-inning error in the Indians' 17–0 defeat aside, Wednesday was a banner day for a handful of the freshest arrivals in the majors. As Michael Beller noted, the error set up Kris Bryant's first career grand slam and eighth home run thus far; he's now hitting .295/.398/.488. Also in that game, Kyle Schwarber made his first career start, going 4-for-5 with a first-inning RBI triple off Shaun Marcum as his first hit, and Addison Russell (.259/.314/.425) added his fifth homer. While it clearly wasn't the three-time Cy Young winner's night, that was just the second home run Kershaw has given up to a lefty this year, with an April 17 shot by the Rockies’ Charlie Blackmon the other, and the fifth he’s given up in 395 regular season plate appearances against lefties since the start of the 2013 season. Not too shabby, kid.